The red blossoms of our native wild columbine seem to glow like dangling lanterns. Their five upturned spurs hold nectar that ruby-throated hummingbirds are well suited to reach with their long, needle-like beaks and remarkable ability to hover. If you’ve been thinking that this spring has been an especially good one for woodland wildflowers, the appearance of native wild columbine in Westborough’s woods confirms that thought. Wild columbine (Aquilegia canadensis) has long been a prize among our native wildflowers, with its intricate blossoms that glow like dangling lanterns. They’re red on the outside and yellow on the inside, with a cluster of five long spurs that store sweet nectar. The plant’s delicate leaves have three leaflets with rounded lobes. Wild columbine grows in Massachusetts (and most states east of the Mississippi River) but springs up only occasionally in Westborough and neighboring towns these days. It is also known as American columbine or eastern red columbine. Wild columbine favors soils that are sweet with lime, so eastern Massachusetts with its granite rocks and acidic soils is not the most encouraging environment for it. Good places to look for wild columbine include areas around old limestone quarries and old lime kilns, and rocky outcrops with limestone. Western Massachusetts, which has more limestone and sweeter soil than eastern Massachusetts, tends to be more favorable than our area, but we do get wild columbine from time to time. It’s a lovely surprise to find it on a rocky ridge or in gravely area. You might easily recognize wild columbine if you’ve seen the cultivated red columbines sold for gardens, which are varieties of the same plant. Not surprisingly, these do well in partial shade in gardens and yards where the soil may have been treated with lime. What about the other columbines sold for gardens – the white, blue, and yellow ones? They are varieties or hybrids of columbine species from the western U.S. or from Europe. You might note that their flower shape is different. Their flowers are wider and more open, with shorter spurs –suitable for pollination by bees, with a nice landing platform for them. Their colors, too, are ones that attract bees. Our wild columbine is another story – it’s red like a hummingbird feeder! The bright red color attracts hummingbirds and butterflies. Our ruby-throated hummingbirds (Archilochus colubris), with their long needle-like beaks and their amazing ability to hover and to fly in all directions, are perfectly suited for sipping nectar from the long spurs of wild columbine blossoms – and for pollinating the columbine in the process. We don’t usually think of birds as pollinators, but when a ruby-throated hummingbird plunges its beak deep into a columbine flower, its head gets covered with pollen from the anthers that you can see hanging down from the flower. Later some of this pollen brushes off in the next columbine flower that the hummingbird visits. 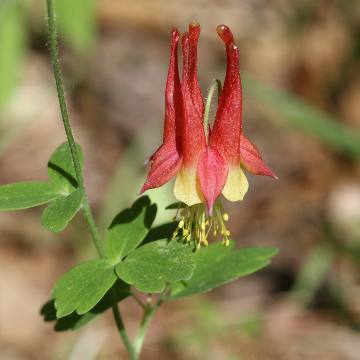 Scientists suspect that our wild columbine evolved its long spurs and red color and became specialized for pollination by ruby-throated hummingbirds as the two interacted over many thousands of years, each benefitting and influencing the successful reproduction of the other. Their relationship provides pollination for the columbine, and food for the hummingbird during the nesting season. In nature, specialization can bring limitations as well as advantages, but fortunately for our wild columbines and our ruby-throated hummingbirds, each has some additional options. Wild columbine is also pollinated by large butterflies with long “tongues” that can reach into the flowers for nectar while the butterfly hovers or hangs upside-down on the flower. Most bees, flies, and other insects can’t reach the nectar in the columbine’s spurs, but some bees gather pollen and skip the nectar. (And sometimes bees, wasps, or other insects chew holes in the spurs to take nectar without pollinating the flower.) And for their part, ruby-throated hummingbirds sip nectar at other plants with deep-throated or long-spurred flowers. If you plant cultivated red columbines in your garden, consider placing a red hummingbird feeder nearby. (But if you find wild columbine in the woods, leave it where it is. It’s too scarce to dig or pick.) If you have a sugar maple in your yard, try planting the cultivated red columbine nearby, since maple leaves tend to sweeten the soil. One hallmark of a native plant is often its many relationships with other native animals or plants. 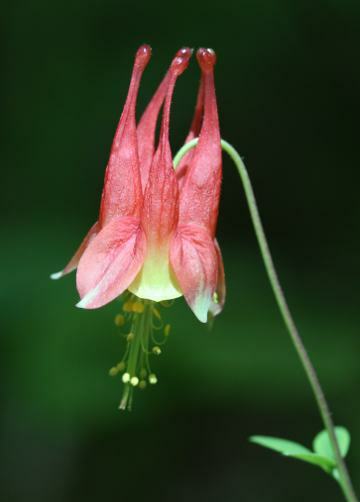 In addition to ruby-throated hummingbirds, wild columbine has relationships with many native insects. Columbine leaf miners are fly larvae that leave tell-tale white trails in columbine leaves as they eat. The columbine borer is a moth caterpillar specialized to feed in the stem and roots. There’s also a columbine aphid. The columbine duskywing butterfly (Erynnis lucilius) lays its eggs on wild columbine, which then serves as food for its caterpillars (but this butterfly is not found in Massachusetts). Native Americans throughout eastern North America knew wild columbine and had an assortment of medicinal uses for it, although it is potentially toxic. Some also used it as a love charm. In contrast, flower lore from Victorian times held that the columbine flower symbolized desertion and folly. It could be bad news to give columbine to a woman, suggesting that her lover, suitor, or husband had strayed. And columbine might bring bad luck to a man. In the present day, this lore can serve as a reminder not to pick wild columbine! Wild columbine is a perennial in the buttercup family (Ranunculaceae). The plants can live several years and spread by seed. Let’s hope that the wild columbine now in our local woods survives and spreads to bloom in future springs.